The Changing Cost of Healthcare in the U.S. According to statistics from the Health Affairs Journal (a publication of Project HOPE, A nonprofit international health organization); Americans pay over $3.4 trillion a year for medical care. Those numbers are staggering. What are Americans getting for their money? Breaking this number down even further, the Centers for Medicare and Medicaid services estimate Americans spent $10,000 in on average for healthcare in 2016 and this number increased to $18,764 in 2017. Healthcare costs vary based on your age and the state you live in. As you would expect, younger, healthier adults pay the least for healthcare coverage. However, even for younger adults—age 21—the cost of coverage varies great based on geographic location. In 2016, a 21-year-old paid $180 per month in health insurance premiums in Utah. The same 21-year-old would pay $426 per month living in Alaska. Likewise, the Utah deductible was $2,160; whereas the Alaska deductible was $5,112. This survey from GoBankingRates.com found that only 27 percent of millennials age 18 to 24 have at least $1,000 in savings, making it difficult for millennials to cover their out-of-pocket healthcare costs. The Affordable Care Act does offer some subsidies to make health insurance more affordable for Americans. However, not everyone qualifies for a subsidy payment. 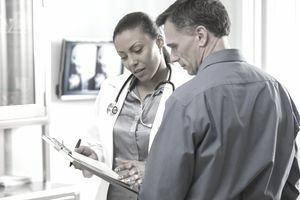 Statistics from eHealthInsurance.com show health insurance premiums for unsubsidized individual customers were $321 per month on average, while family premiums averaged $833 per month. Additionally, the average individual deductible was $4,358 and the family deductible averaged $7,983. Data from the annual Milliman Medical Index shows the most common health care plan for a family of four costs on average $28,166 in 2018. This estimate includes employee and employer contributions as well as out-of-pocket expenses such as co-pays and deductibles. In an effort to allow customers to choose a plan that fits both, medical needs, as well as a family budget, health care providers offer tiered coverage. A basic benefits package will have higher deductibles and co-pays but will go for a much cheaper monthly premium. On the other hand, the higher-tiered plans with low deductibles and little or no out-of-pocket expenses will be out of reach for the majority of Americans. However, even basic health care coverage with higher deductibles and co-pays is better than the alternative—no healthcare coverage at all. In recent years, healthcare costs, as well as monthly and annual insurance premiums, have continued to rise for both individuals and families in America. The average monthly health insurance premium for a family increased from $369 in 2008 to $1,021 in 2017. Health insurance costs are expected to rise another 5.6 percent by 2025. With the increasing costs of healthcare, how can Americans save on healthcare and the cost of insurance? Consumers must be diligent and do their research to compare plans and get the most comprehensive health coverage they can afford. If your employer offers health insurance and pays for a large portion of the premium, it is a great option to consider. If not, shop the health insurance exchange for affordable coverage and check to see if you qualify for any subsidy plans to help offset the cost of health insurance. Health savings accounts can also help you pay for out-of-pocket expenses such as co-pays and deductibles. Finally, if you have a catastrophic accident or illness, ask the hospital for help with a payment plan. Many hospitals will reduce their charges for those who are unable to obtain insurance.